Caucher Birkar, Professor of Mathematics in the Department of Pure Mathematics and Mathematical Statistics, has been awarded a Fields Medal at the International Congress of Mathematicians in Rio de Janeiro. Birkar has been awarded the highest honour in mathematics for his contributions to algebraic geometry. $$y=2x+1$$ describes a line of slope $2$ which intersects the vertical axis of a standard Cartesian coordinate system at the point $(0,1)$. Similarly, the equation $$x^2+y^2=1$$ describes a circle of radius 1 around the point $(0,0)$ in our coordinate system. (This follows from Pythagoras' theorem, see the figure below). 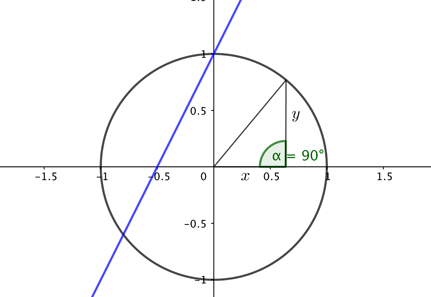 The circle and the line are both examples of algebraic curves in the Euclidean plane: curves that are defined by algebraic equations. Going up a dimension, we can also consider algebraic surfaces. The sphere in 3D Euclidean space that is centred on the point $(0,0,0)$ and has radius $1$ is an example. In analogy with the circle in the dimension below, it's given by the algebraic equation $$x^2+y^2+z^2=1.$$ As you might already expect, a plane in 3D space is another example of an algebraic surface. But we don't need to stop here: more complicated polynomial equations, perhaps defined over a wider class of numbers called complex numbers, give rise to the general notion of an algebraic variety. Algebraic curves and surfaces are examples of algebraic varieties, but in general algebraic varieties can be much more complex: they can even exist in higher dimensions which can't be visualised. That's not something that deters mathematicians, however, because they've long developed a way of doing geometry even when there are too many dimensions to imagine. But you might also allow yourself a little more flexibility. 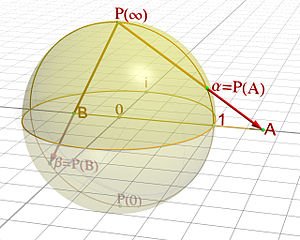 The projection shown in the figure shows how a sphere minus a point can be turned into a plane: essentially, you remove one point, then press the rest of the sphere flat and stretch it infinitely in all directions. It seems that the plane and the sphere are distantly related after all, and we might keep this in mind when classifying algebraic surfaces into families. Birkar was born in 1978 to farmers in the Kurdistan Province of Iran, and went to school during the turmoils of the war between Iran and Iraq. "My city is right on the border. You can imagine we were an easy target. The threat was always everywhere," he told an audience at the International Congress of Mathematicians. "When I was born in my village life was traditional – we produced everything we needed." Explaining how he became one of the world's greatest mathematicians he said, "It has to do with the way of life of the region. The other reason is that Kurdish culture has been conditioned for difficulties by its history. [Also], when I was 10,11,12 my brother helped me a lot to learn mathematics. Family helps enormously – directing, not pushing." The award of the Fields medal in Rio also made headlines for a non-mathematical reason: as Birkar stood after the ceremony to receive congratulations, his briefcase containing the medal was stolen from directly behind him. The organisers of the conference, and the International Mathematics Union which awards the Fields Medals, went to great lengths to help local police find the thief, and of course, to replace Birkar's medal. The replacement was awarded in a brief but moving ceremony a few days later. Birkar took the theft in his stride. "This has been widely covered in the media, and now I am more famous than I would have been," he joked as he received his medal for the second time. "And the number of people who know what a Fields Medal is is way more than it was last week." "In the beginning it was a shock, it happened so fast. But very soon I recovered. In the grand scheme of things this is a really really small thing. I have seen much worse things in my life, and if I was discouraged by such small things I wouldn't be here in the first place." You can watch our video interview with Birkar here.